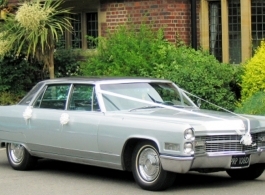 This 1966 Cadillac is a Fleetwood Brougham model in Silver Grey with a newly re-trimmed matching colour interior. The spacious interior of this large wedding car can seat up to 5 passengers in comfort, style and safety as each passenger will have a professionally fitted seat belt. There is an MP3-compatible sound system, so you can either plug in your own MP3 player or request a choice of music in advance. The Whitewall tyres and chrome detail add to the appeal of this American classic as well as making it look even better in your wedding day photos. The car will be driven by a polite, friendly driver who is very experienced in driving a variety of large American vehicles on UK roads.